For companies, factories, employees, teachers, sport coaches, life guards, security & fire personnel, school children & doctors. Our aim of our courses is to impart the latest evidence based knowledge through short duration interactive presentations & workshops which are also cost effective. 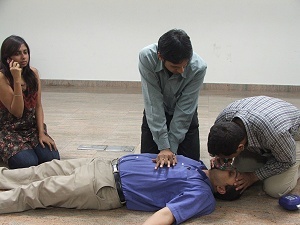 The idea is to deliver training which will immediately & effectively improve emergency care. Our courses do not constitute an academic or clinical certification standard, but will ensure that a candidate recieves adequate knowledge & skills necessary for the proper management of common injuries, cardiac arrest, trauma and disaster scenarios. Our First Aid Responder Course is specifically designed for non-healthcare personnel like students, school teachers, software engineers, factory workers, life guards, police & fire fighting staff, paramedics, ambulance drivers, physiotherapists, etc. Basically anyone can attend this course. This course is designed for doctors, nurses & paramedics who are caring for patients at risk of cardiac arrest. Staff working in emergency rooms, ICUs, operation theatres, wards, ambulances, sports medicine teams, etc, will all benefit from this course. This course is designed for doctors, nurses & paramedics who are caring for trauma victims. Staff working in trauma rooms, emergency rooms, ICUs, operation theatres, wards, ambulances, sports medicine teams, etc, will all benefit from this course. This course is designed for emergency physicians, specialty doctors, nurses, paramedics, pharmacists, security & fire personnel, staff managers, administrators, radiologists, policy makers, heads of hospital allied services like food, maintenance, blood bank, telephones, engineering, etc, who may be involved in a disaster management scenario. All Life Responder courses will be done onsite only. All courses are taken for a batch of minimum 10 candidates. Individual training is not given. Maximum number of candidates per batch must not exceed 30. Arrangement of seating hall, LCD projector, audio equipment, tea/snacks, etc, is the responsibility of the organizers. For Code Blue Responder and Trauma Responder courses, all equipment necessary for the management of cardiac arrest or trauma victim, like defibrillator, laryngoscope, ET tubes, AMBUbag, etc, must be available onsite for use during training. The detailed list of required equipment will be given. This also ensures that an institute has access to well organised life saving equipment within its own premises. The cities of Bangalore, Chennai, Hyderabad & surrounding areas are covered. Other cities will be considered on request. We also provide assistance in organizing the following official certification workshops at your site.